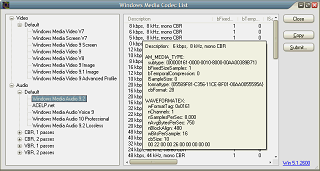 Windows Media Codec List utility uses IWMCodecInfo interface (see also IWMCodecInfo2, IWMCodecInfo3) lists installed Windows Media Codecs and their formats and presents the findings in a convenient way. The utility gives a quick idea what a programmer would obtain through IWMCodecInfo2/IWMCodecInfo3 interfaces and what well known format structures (WM_MEDIA_TYPE, AM_MEDIA_TYPE, WAVEFORMATEX, VIDEOINFOHEADER) correspond to particular format. 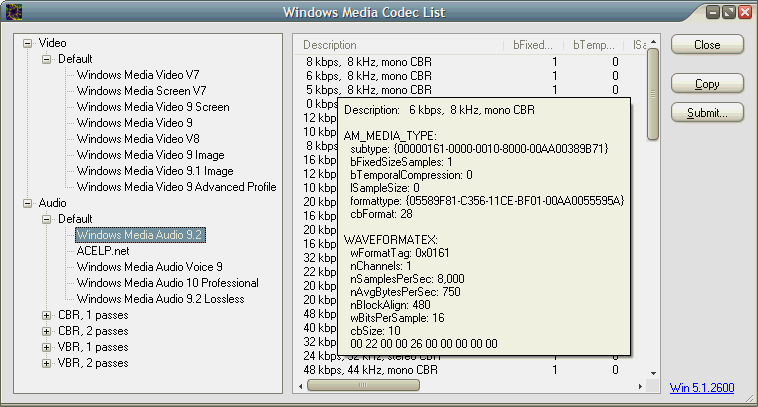 For a description of Windows Media video and audio codecs, check article Encoding Audio and Video with Windows Media Codecs. Copy button copies discovered information into clipboard in comma-separated values (CSV) format (e.g. suitable fo rMicrosoft Excel). Submit button posts the same information to this website for… possibly further aggregation. Partial Visual C++ .NET 2008 source code is available from SVN, release binary included. WVC1, also known as Windows Media Video 9 Advanced Profile, implements a more recent and fully compliant Advanced Profile of the VC-1 codec standard. It offers support for interlaced content and is transport independent. With the previous version of the Windows Media Video 9 Series codec, users could deliver progressive content at data rates as low as one-third that of the MPEG-2 codec and still get equivalent or comparable quality to MPEG-2. The Windows Media Video 9 Advanced Profile codec also offers this same improvement in encoding efficiency with interlaced contents. A decoder for WVC1 is included in Windows Media Player 11, which is bundled with Windows Vista and is available as a download for Windows XP.